In order to be successful in an online course, it is important to familiarize yourself with the overall structure and elements of the environment in which you will be learning. For instance, you most likely know how to find your way to the library when in need of resources. The information below will help you identify the major areas of the course environment, along with the various types of content that may be used within a course. Global Navigation The navigation menu provides you with course information and management options. You will notice that even within a course, the top area remains the same. We refer to the tabs and buttons in that area as universal navigation since they stay with you no matter where you are in Blackboard. To the left will always be your Course Menu and to the right will always be where the course content will be displayed. When you click on a menu item on the left, the area to the right changes. Learn how to quickly access your course information through the Global Navigation menu. 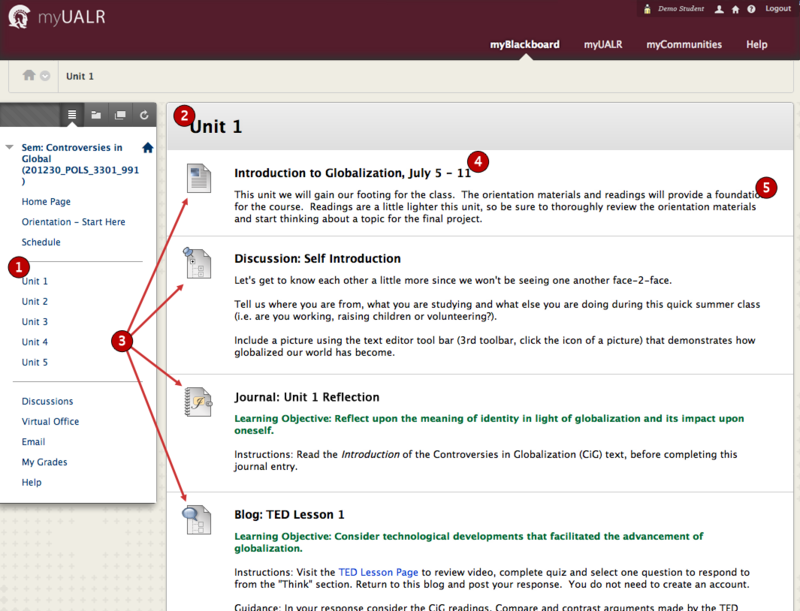 Selecting the Global Navigation button allows you to access course information through several convenient menu icons. Visit your recent courses, access tools, emails, announcements, and update your settings. 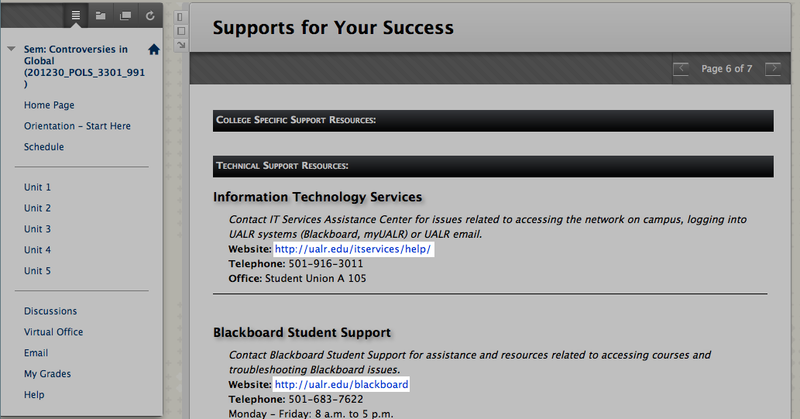 Once you have entered a Blackboard course, you will see a list of links down the left hand side of the screen. This is known as the Course Menu. Use these links to access and view various areas of the course. Each Course Menu may vary slightly depending on your instructor’s preferences. As such, your courses may look a bit different from each other and have different sets of tools available. Instructors customarily will group related items together under a particular navigation link. For example, the syllabus, course policies and schedule might be found in a section called Course Overview. Handouts, assignments, and lecture notes might be found under a link titled Lesson One, Chapter Materials, or Course Documents. Within these areas, you will typically find your assigned learning materials in the form of text, graphics, and files. 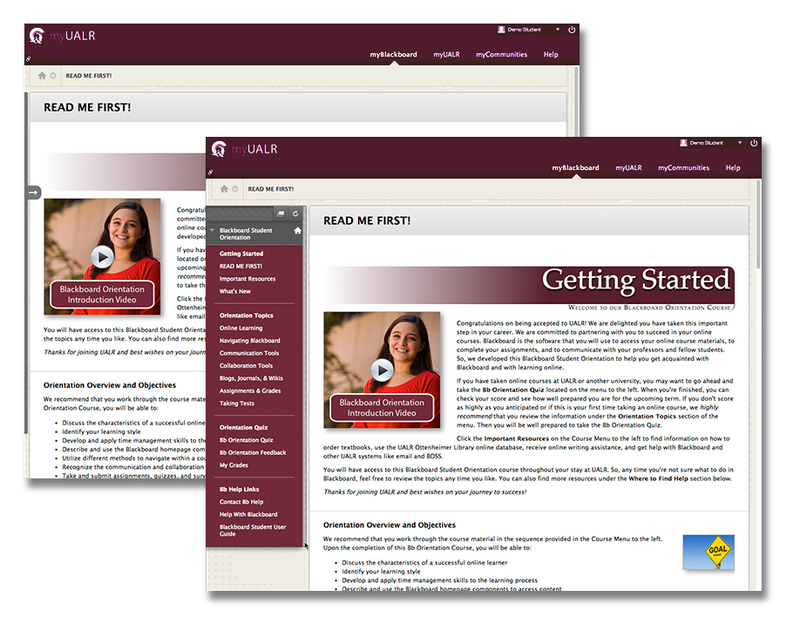 Instructors can customize the names the content and tools on their course menu. Keep this in mind as you go through your online courses. Some tools, like Blackboard Messages or the Course Module Page, may have a name relevant to the structure of the course and not necessarily the name of the tool itself. At the top of the Course Menu is a set of icons that can be used to change the Course Menu. Presents the Course Menu in List View. The links to various areas in the course are listed as text links or buttons. 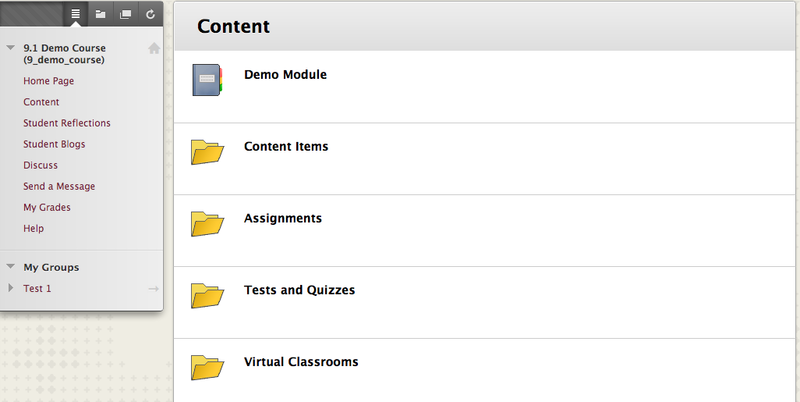 Presents the Course Menu in Folder View. The links to the various areas in the course are represented as folders that can be expanded to reveal items and collapsed to save space. Opens the Course Menu in a separate window, referred to as the Course Map. Refreshes the Course Menu to see any new content. On the first day of the new term, it is a good idea to click each link on your Course Menu and explore each area. You should soon see a pattern emerge which will help you know where to find the particular information you are looking for. If you have questions regarding the course structure or organizations, contact your instructor for clarification. 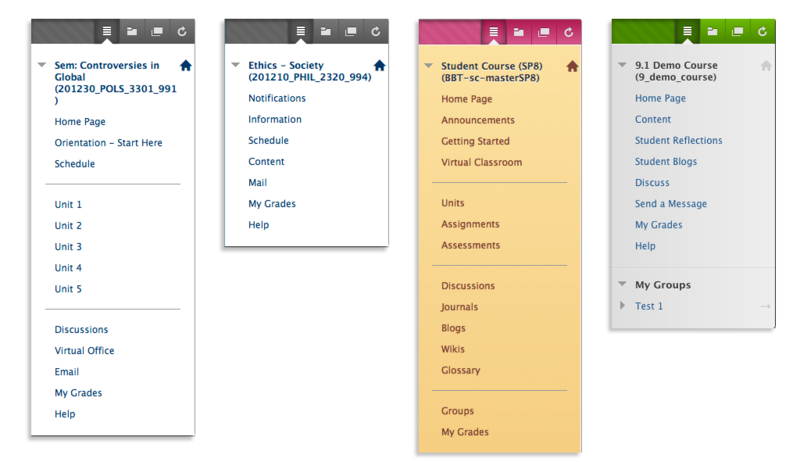 Below are four different examples of Course Menus design and organization. The differences between these course menus are similar to the differences you might see in the set-up of the classrooms on campus. The layout may vary between your courses, but they will function roughly the same. The Course Menu is the primary navigation feature in every Blackboard course. In certain situations, it may be necessary to collapse the course menu to increase the viewing area of the course content. Some learning objects (i.e. content items, learning modules, etc.) will auto-collapse the course menu to make the content easier to read. When the Course Menu is expanded, the Show/Hide Course Menu toggle is located between the course menu and the main content area. If you hover your mouse near this area, you will see a dark grey bar. 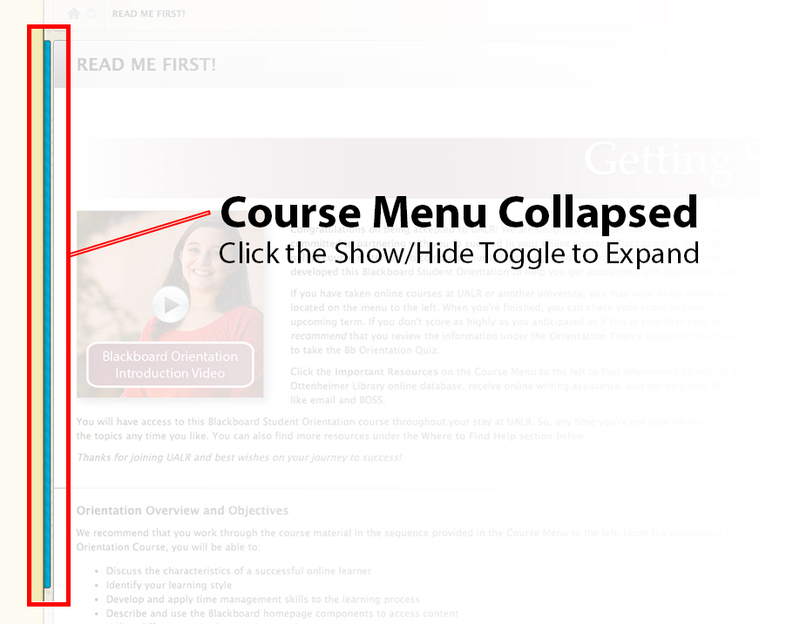 Click the Show/Hide Course Menu toggle to collapse the course menu. When the course menu is collapsed, the Show/Hide Course Menu toggle will be located along the edge of your browser window. It will appear as a light grey striped bar. 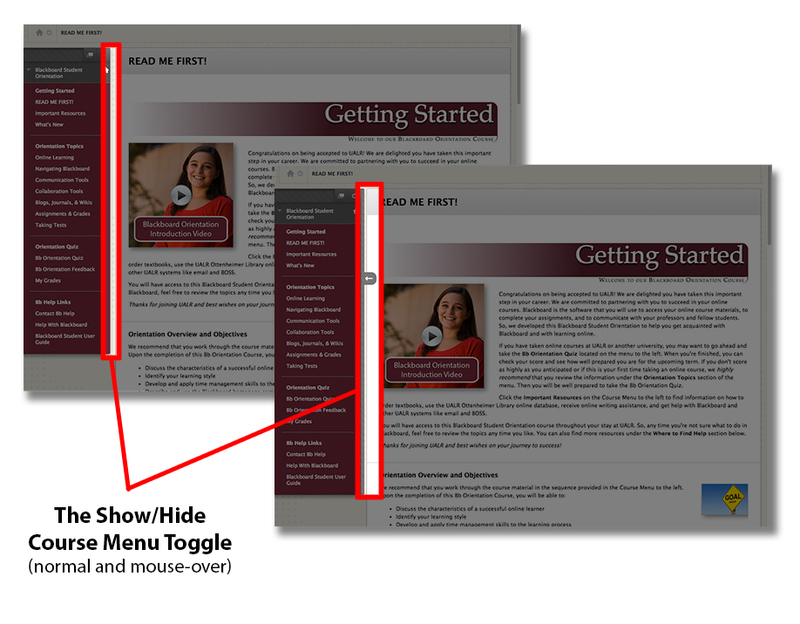 Click the Show/Hide Course Menu toggle to expand the course menu. The Course Module Page is a type of content page inside your Blackboard courses that is similar to the Notifications page on the My Blackboard tab. The Course Module Page contain information related to the course like content updates, assignment due dates, and upcoming course events. While module pages can be placed anywhere in the course, the system automatically creates a Course Module Page that serves as the default entry page, or home page, for all new Blackboard courses. While the Course Module Page is the default home page for new Blackboard courses, instructors have the option of changing this setting. 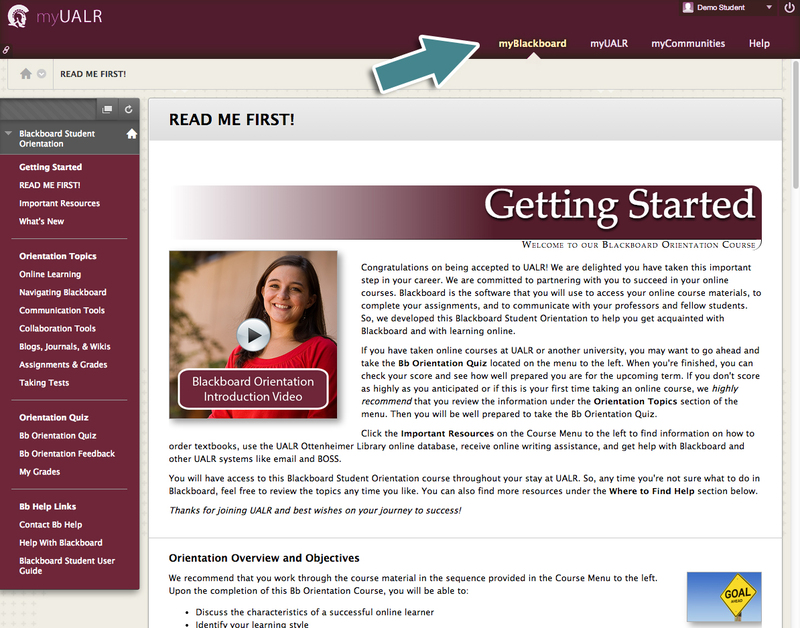 For example, in the Blackboard Student Orientation, the Course Module Page is not the course home page. To access that course’s Module Page, you would click the What’s New link on the course menu. As a student in Blackboard, when you click a Course Menu link a variety of content types will be displayed in the content frame. For example, you might see some text and graphics, links to files, links to Web sites, and even folders that contain more content. Course Link These links will take you to different areas of the course and allow you to access the majority of your course content. Page Title Lets you know which page you are viewing. Course Icons An easy way to distinguish the different types of content items is by looking its icon. As you can see here, content items have a different icon than discussions or blogs. As you progress through the rest of the materials in this course, you will be presented with the icons for the other types of content. Content Name The name of the content. Some content names also act as course links that link to other areas within the course. You always want to hover over the content name to see if it is a link or not. Content Details This area is used to display additional information related to the content. This can be a description, informative text like what you are reading now, or instructions. A Content Item in Blackboard can contain one or a combination of many elements such as text, graphics, audio or video, and links to files. An example is displayed below that includes a variety of elements. Your instructor may use Content Items to share information such as course lessons, instructions, and class policies or procedures. Folders in Blackboard work in much the same way they do in other computer applications and even like paper file folders. Blackboard folders are containers that hold information or more folders. Just like a physical file folder, you must open the folder first to view the items within. You open a folder in Blackboard by clicking on its title. You will see the breadcrumb trail lengthen with the folder name once inside. 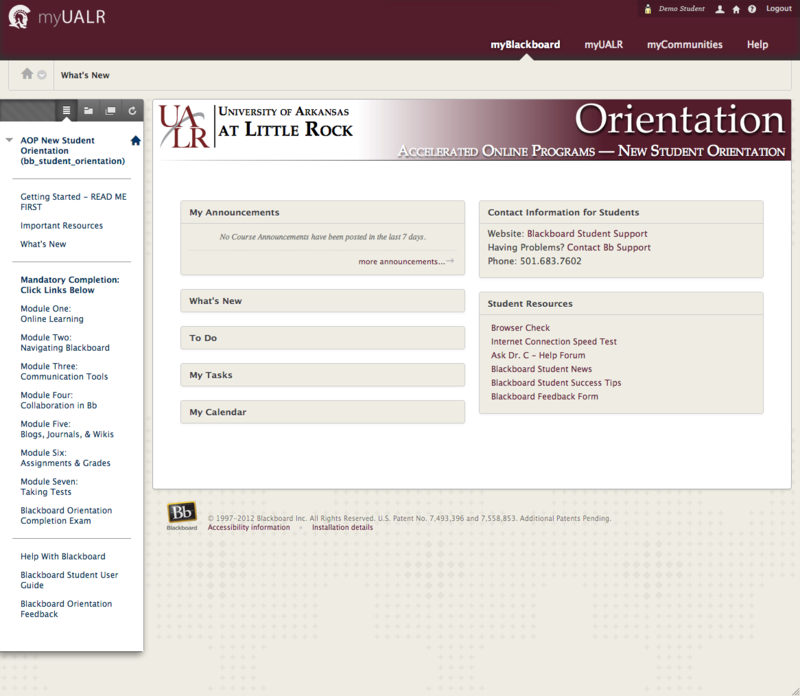 In general, UALR’s Blackboard web links are displayed in maroon, underlined text. In your other courses, the web links may be in different colors depending on the course theme. Just be aware that if the text looks different (bold, a different color than the surrounding text, underlined, etc. ), it is probably a web link. The simplest way to find out is to hover over or click the text. Also, your mouse pointer will usually change if the text is a link. Links can open inside the content frame or they can open in a new window. Your instructor will set this function when the link is added to the course. Course Links are similar to bookmarks in your web browser. They are used as a way for your instructors to create a shortcut to other items within your course. As opposed to the Web links we just reviewed, Course Links are internal links that provide shortcuts to different areas within a course. 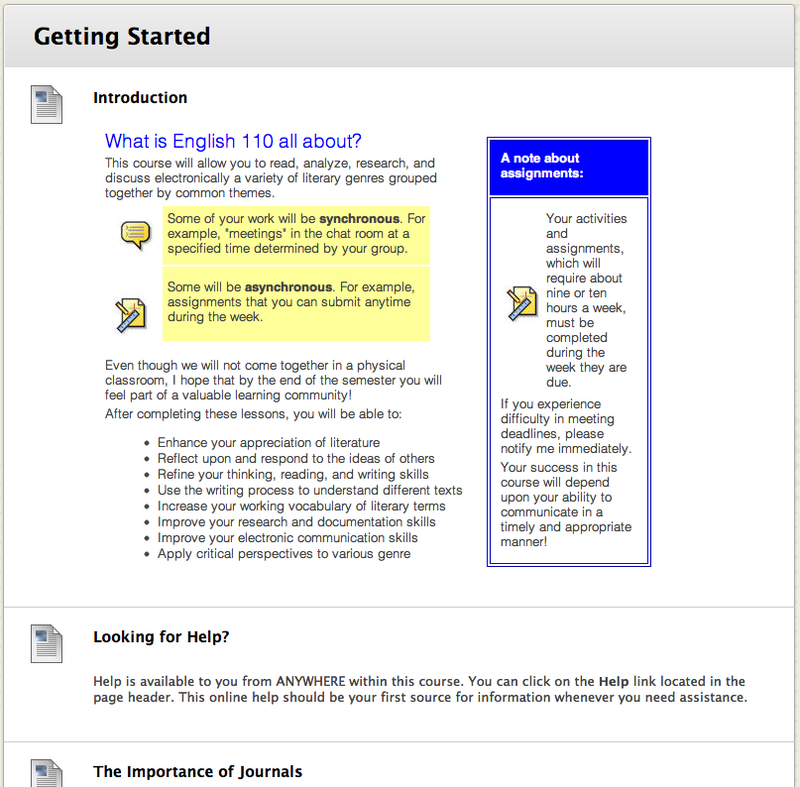 Instructors typically use course links to help organize the course content. For example, an instructor might link directly to a discussion board within a weekly unit so students can access the forum more easily. There may be times when the topics you are learning require review in a more structured order. For instance, when you are learning a process such as the steps to solving an equation, the scientific method, or the elements of fiction, you may learn them in a specific order. To reinforce this, your instructor may make use of a Learning Module, which automatically sets a structured path for progressing through the content. As opposed to scrolling down to see the information, like with a Blackboard Folder, you would proceed through a sequence of screens using the Table of Contents or the forward and back arrows to move from one page to the next. Some Learning Modules are designed to only be viewed in a sequential order. 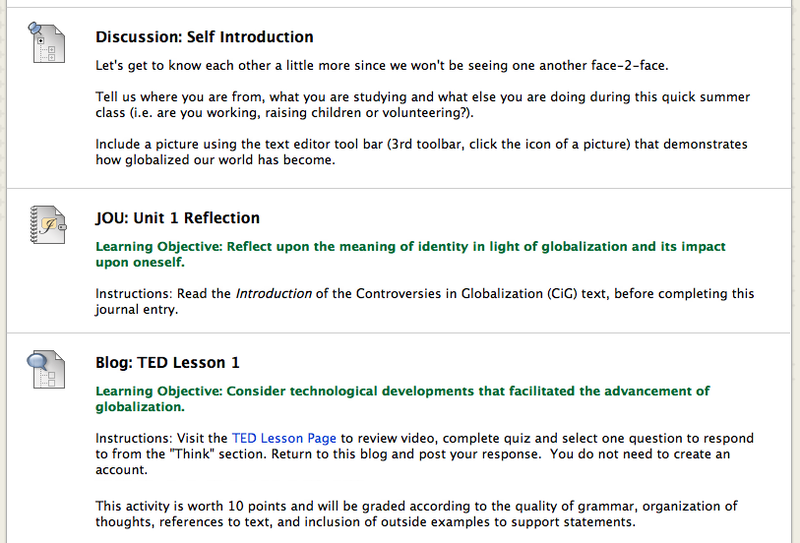 The items in these types of learning modules must be viewed in order, you cannot jump ahead to another section. Other Learning Modules have a suggested path you should follow, but you have the option to skip ahead to another unit within the module if the Table of Contents is present.